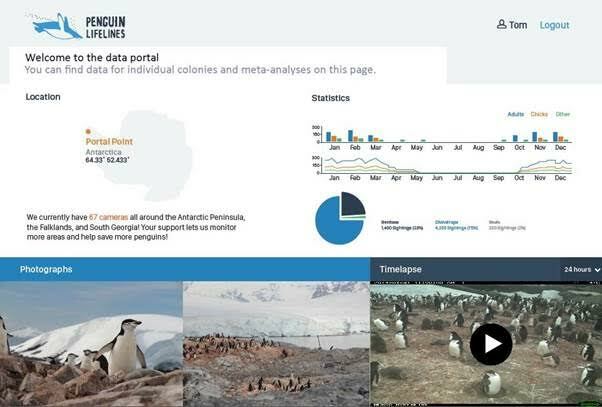 Yesterday we launched our latest project: Penguin Watch. It is already proving to be one of the most popular projects we run, with over one hundred thousand classifications in the first day! The data come from 50 cameras focussed on the nesting areas of penguin colonies around the Southern Ocean. Volunteers are asked to tag adult penguins, chicks, and eggs. 1st Rule of Penguin Watch – You don’t have to count them all. But I dare you to! I think they want in! This post is from Debbie Soltis, a 2013 Zooniverse Teacher Ambassadors Workshop participant. She teaches 9th grade Integrated Science and Astronomy at Chugiak High School in Chugiak, Alaska. A 19-year classroom veteran, Mrs. Soltis enjoys presenting a variety of activities and hands-on experiences because she believes students learn best if they have fun and are motivated by authentic experiences. I recently uploaded my first Zooniverse lesson plan, Serengeti Ecology. Since posting the lesson, I actually completed the lesson with my 9th grade Integrated Science students. I also had a colleague do the lesson with his 9th graders for a total of about 80 students participating. Two other colleagues are now also planning on using this lesson with their IS9 students. What follows are my reflections on my lesson and our students’ reactions. My Zooniverse lesson was a supplement to the lessons I have done many times in my ecology unit. My ecology unit always begins by trying to write a definition for life. My students brainstorm characteristics of life and are then presented with a hands-on activity examining and testing three sand samples. The sand samples are made using sand and salt; sand, sugar and yeast; and sand and crushed effervescent tablet. Since the overall scientific question in the ecology unit is how do the biotic and abiotic factors interact to obtain matter and energy, another short lesson is a mini-field trip outside to observe, collect, and sort biotic and abiotic examples. Aside from the animals, I directed the students to look at the other biotic features in the snapshots—the grass, trees, and brush. Observations led to inferences about the kind of climate the Serengeti has. Overall, the students really liked the authentic scientific nature of the research being done as well as the fact they were contributing to that effort. As I continue with predator-prey relationships, limiting factors, carrying capacity and other ecological concepts, I feel this lab has provided a real personal experience that will give them a solid foundation on which to scaffold these concepts. In summary, anyone who teaches a biology or ecology unit can use this site—it was fun, generated excitement, and provided a wonderful learning experience for all!